A sign on a recycling bin near the Mann Laboratory at the University of California, Davis, clearly reads "Bottles and Cans Only." It says nothing about wasps. 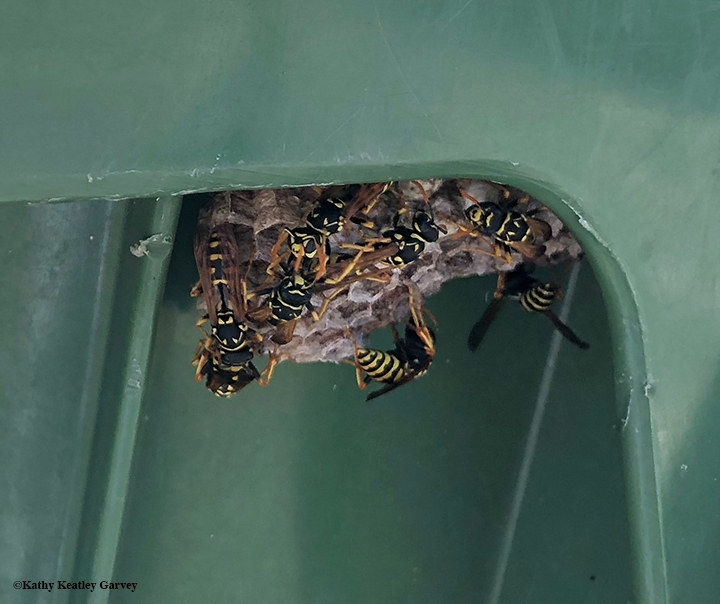 But there they were: European paper wasps (Polistes dominula) building a nest yesterday beneath the overhanging lid of a bright blue recycling bin meant for "Bottles and Cans Only." "They make open-faced nests under eaves all over the place," says Lynn Kimsey, director of the Bohart Museum of Entomology and professor of entomology at UC Davis. 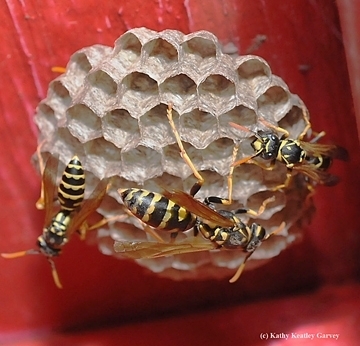 Associate professor Amy Toth of the Department of Ecology, Evolution and Organismal Biology, Iowa State University, Ames, who studies European paper wasps (she's also delivered several presentations at UC Davis) says she's seen "many interesting (nest) places— in mailboxes, under the caps of metal gas cylinders, on outdoor thermometers." But her all-time favorite was this one: European paper wasps building a nest inside a donation box at the Reiman Gardens at Iowa State University. 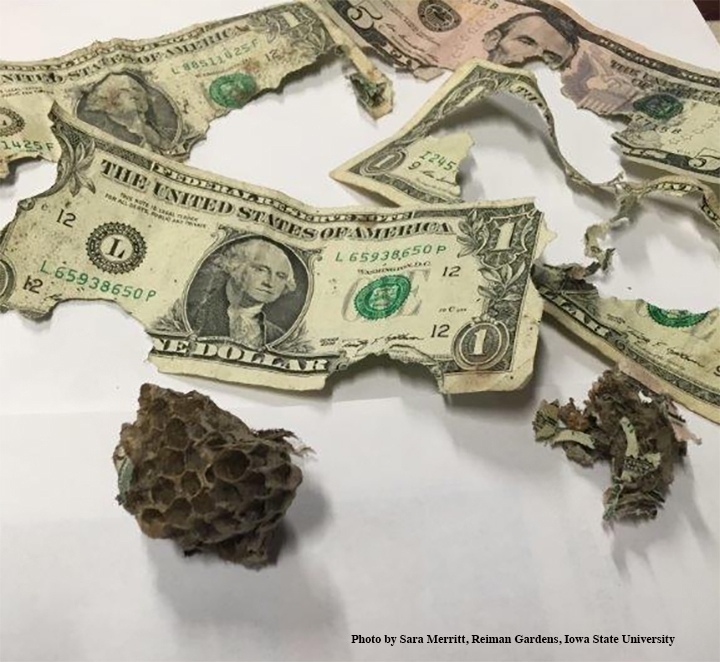 "The wasps were using the bills as building material for their nests," shw related. "These ladies had expensive taste!" They're also meat eaters. We've seen them shred adult Gulf Fritillary (Agraulis vanillae) butterflies and caterpillars in our yard and fly off with the parts. 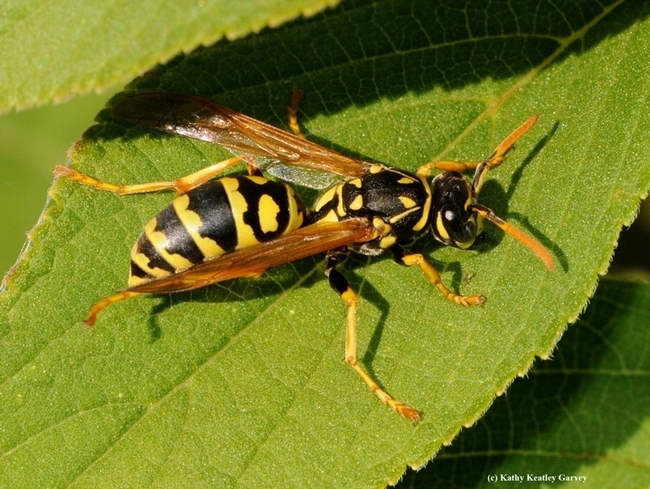 Since this is National Pollinator Week, it should be noted that European paper wasps are pollinators. Take it from Professor Toth who loves her research subjects. It was she who coined and popularized the Twitter hashtag #wasplove. For a previous Bug Squad blog, we asked what she loves about wasps. Her answers are worth repeating! They contribute to biocontrol of lepidopteran pests in gardens and on decorative plants. They have been shown to carry yeasts to winemaking grapes that may be important contributors to the fermentation process and wonderful flavors in wine! They are the only known insect (Polistes fuscatus) that can recognize each other as individuals by their faces. They are devoted mothers that will dote on their young all day long for weeks, defending their families with fury. They are artists. They make perfect hexagonal nest cells out of paper, which they make themselves out of tree bark + saliva. They are extremely intelligent. They're predators, architects, good navigators, and great learners. Among insects, they have large brains, especially the mushroom bodies (learning/memory and cognition area of insect brain). They are beautiful, complex, and fascinating creatures! That they are. 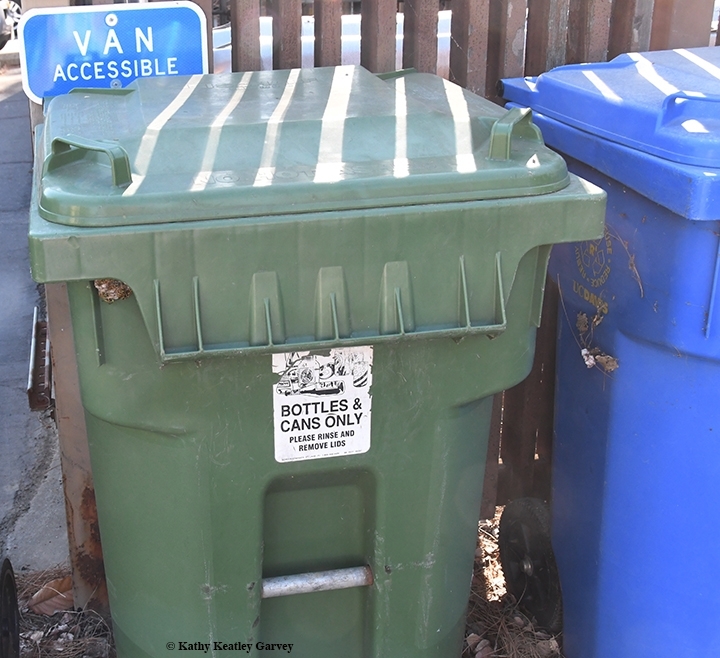 However, they have never been known to read or adhere to "Bottles and Cans Only" signs--or stay away from donation boxes filled with paper bills.